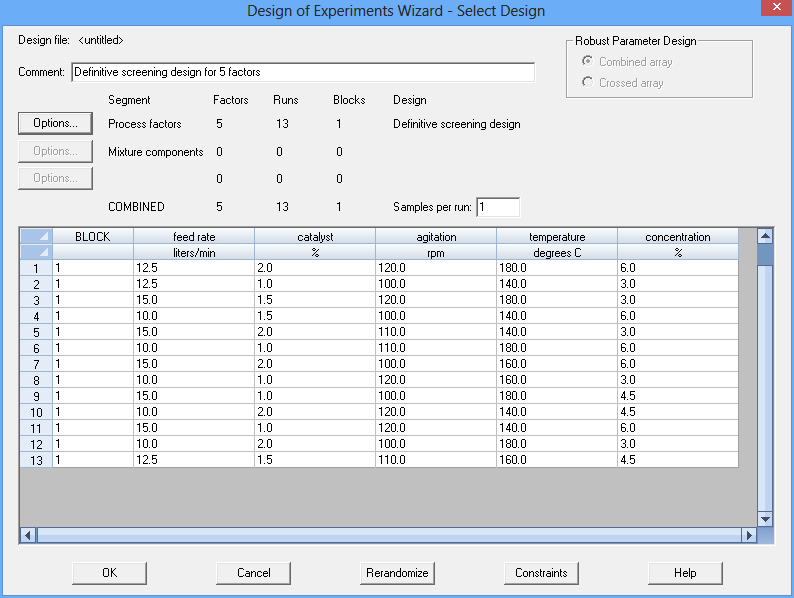 The use of experimental design for process optimization is a well-established technique that encourages efficient use of experimental resources. It's one of those areas of statistical analysis where the ROI is relatively easy to quantify and can be extremely high. I still remember when Stu Hunter lectured to us in his course on DOE when I was an undergraduate engineering major. He began each lecture with a story about how he'd used what we were about to learn to help some company improve their processes. He had a unique knack for bringing real life into the classroom and encouraged many of us to pursue careers in statistics. We spent a lot of time in that class talking about screening designs. Screening designs are experiments that involve simultaneously changing the levels of many input factors, with the goal of identifying those "vital few" factors which have the greatest impact on the response variables. We talked a lot about 2-level factorial and fractional factorial designs. We even learned how to use Yates' Algorithm to calculate effects (this was when handheld calculators were just appearing). Stu taught us about interactions, confounding, half-normal plots, and various other analysis techniques that could help identify the important factors. 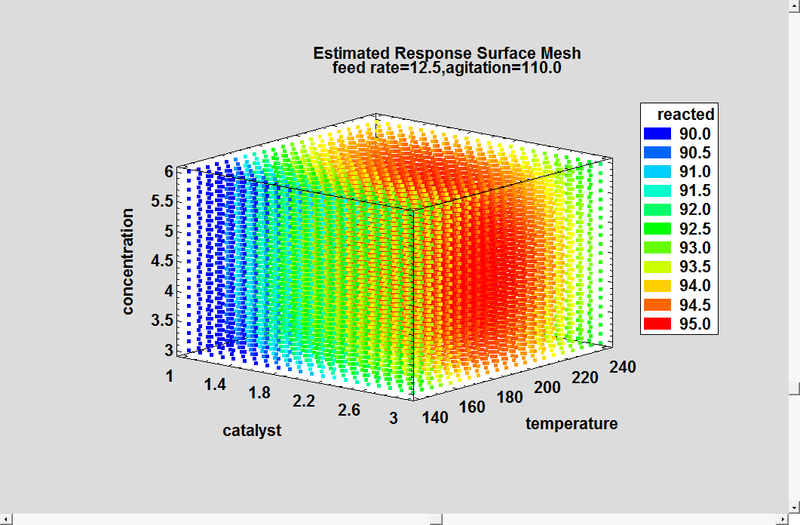 We also learned how to augment the original experiment by adding additional runs to enable us to fit a real response surface model in whatever factors turned out to be important. In recent years, a class of experimental designs called "Definitive Screening Designs" have been developed that enable experimenters to fit a response surface model without doing additional runs. The initial set of runs has enough levels of each factor so that once insignificant factors have been eliminated, a second-order model with quadratic effects can be estimated in the remaining factors. 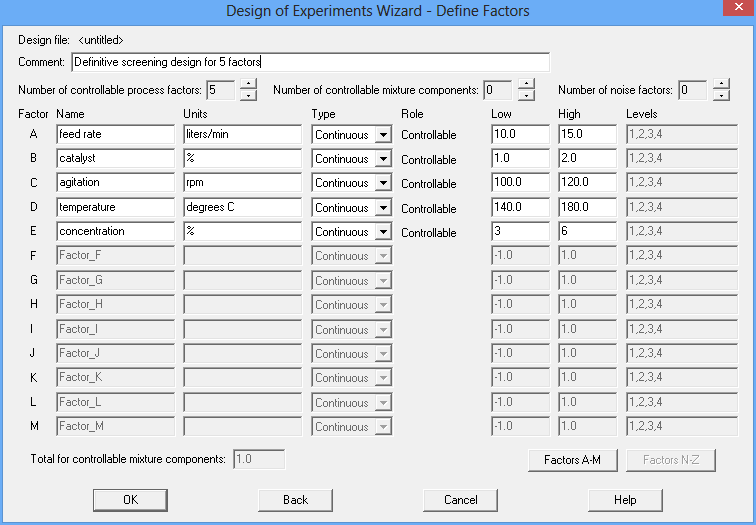 Comparable in size to factorial experiments, they are a good alternative when curvature in the response variable is expected and the experimenter wants to avoid doing a second set of experimental runs. 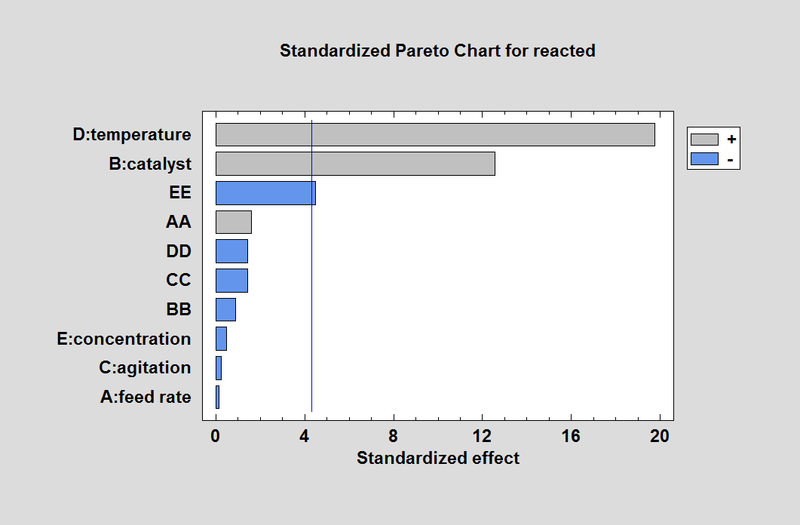 Statgraphics 18 includes definitive screening designs in its design catalog. Their construction and application is described in this blog. In Box, Hunter and Hunter, they proceed by constructing a 16-run 25-1 fractional factorial design. Each factor is run 8 times at a low level and 8 times at a high level. The design is resolution V, meaning that there is no confounding amongst the main effects and the two-factor interactions. 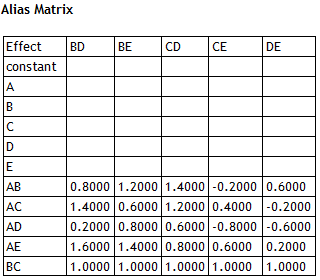 However, since there are only 2 levels of each factor, it is impossible to estimate quadratic effects of the factors. As we shall see, a definitive screening design exists in 13 runs that provides an alternative to the fractional factorial design. We'll also discuss the strengths and weaknesses of the 2 design choices. 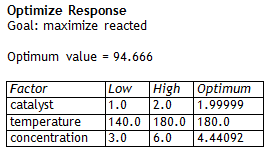 The goal of the experiment is to find a combination of the 5 factors that maximizes the percent reacted. In this example, all 5 factors are continuous and may be run anywhere over the interval defined by the low and high values. Definitive screening designs, like 2-level factorial designs, may also include categorical factors provided they have only 2 levels. The list ranges from a full 2-level factorial design consisting of all 32 combinations of the low and high levels of the 5 factors to a quarter fraction in 8 runs. 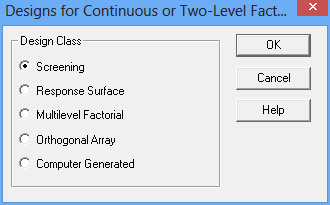 As noted earlier, the 25-1 half fraction is very popular since it is resolution V and therefore does not confound any of the main effects or 2-factor interactions. 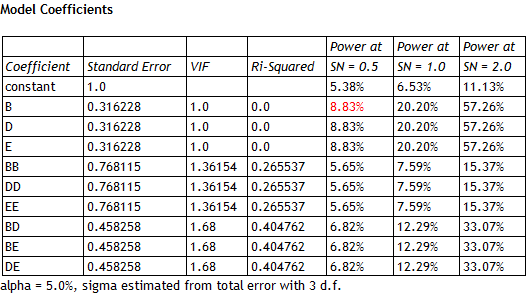 Since it is a fully saturated design leaving 0 degrees of freedom to estimate the experimental error, several additional runs are usually added at a central value of all the factors. m’ = m + k.
Notice that each factor is run 5 times at its low level, 5 times at its high level, and 3 times at a value halfway between the low and the high. Note also that the 3 central values for each factor are run once at the low level of every other factor, once at the high level of every other factor, and once at the central level of each factor. Since this design also has 0 degrees of freedom for estimating the experimental error, additional replicates of the centerpoint (run #13) would often be added to the design. 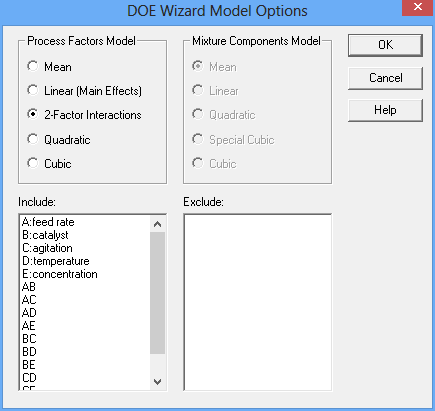 There is a constant term, 5 main effects, 10 2-factor interactions, and 5 quadratic terms. Obviously, 13 runs is not sufficient to estimate this entire model, so only a subset may be fit. 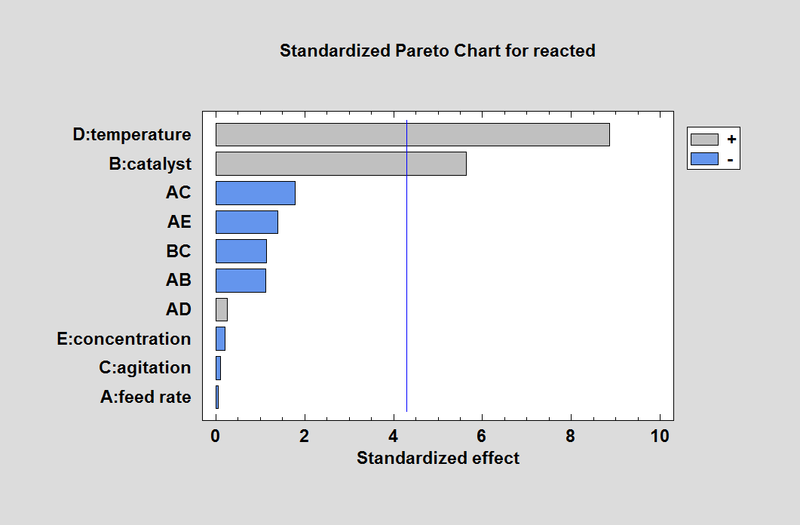 Main effects are uncorrelated with each other, with the quadratic effects, or with the 2-factor interactions. Quadratic effects are uncorrelated with the main effects but have small correlations with each other. They are also correlated with the 2-factor interactions. 2-factor interactions are correlated with each other. As with other resolution IV designs, it may be possible to sense the presence of 2-factor interactions but they will be very difficult to identify. This illustrates the real attraction of the DSDs. 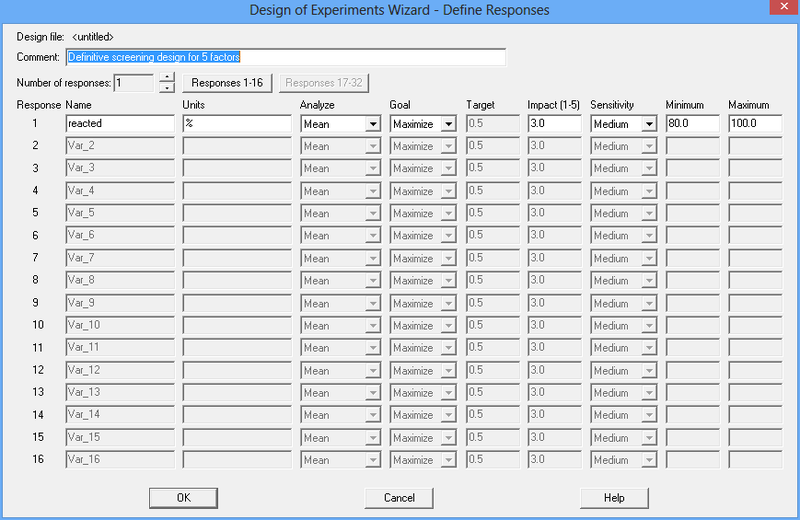 Without running additional experiments, it is possible to get a reasonable estimate of the response surface in any 3 factors. Notice that the VIFs are relatively low, so the fitted model could well be used for process optimization. To fit such a model after running a 2-level fractional factorial design, additional experiments would need to be done, such as adding star points to create a central composite design. The importance of concentration is now evident through the term "EE", which represents its quadratic effect. 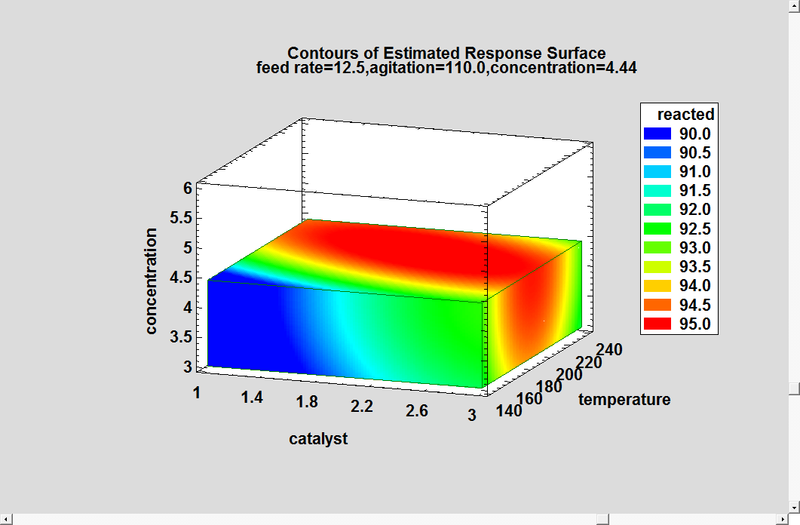 At this point, we would have correctly identified the 3 active factors, although we haven't yet detected the interaction between temperature and catalyst. 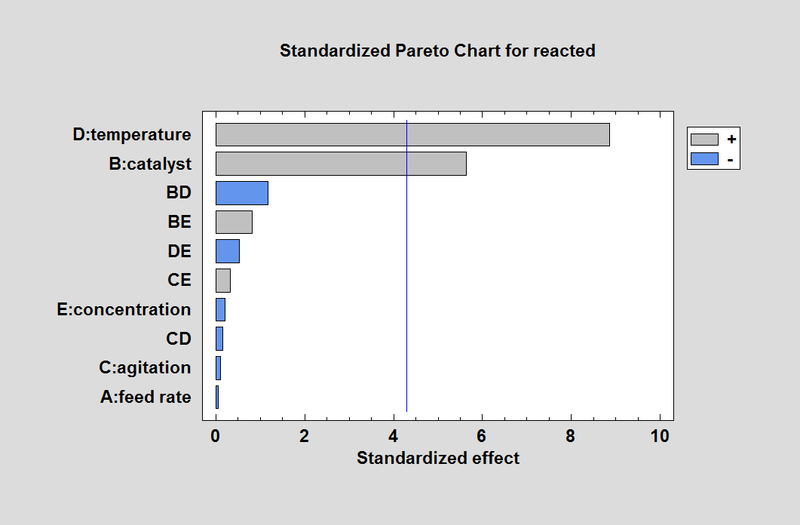 The Pareto chart correctly identifies the active terms in the model from which the data were generated. A response close to 95% is obtainable throughout the entire range of concentration. 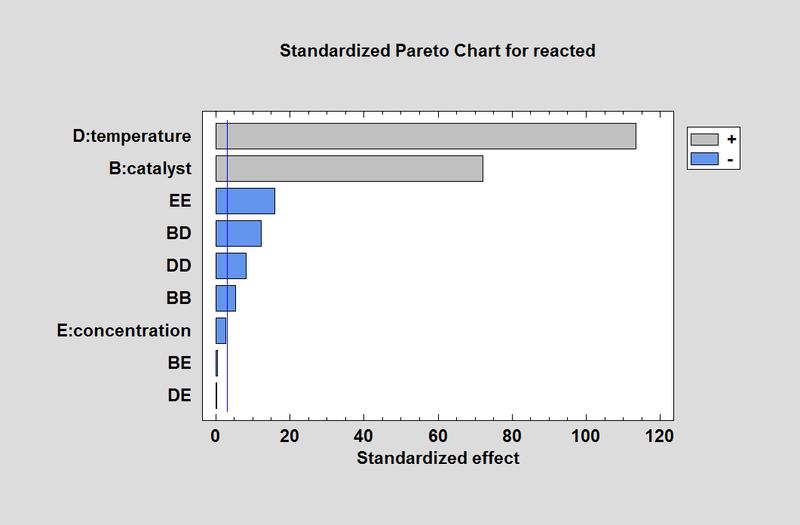 You can also see the effect of the interaction between catalyst and temperature, with the optimum value of one depending on the value of the other. . The definitive screening designs provide a way to both identify the most important factors and optimize the response variable using a single set of experimental runs. As such, they are an economical solution for experimenters whose final goal is process optimization. Box, G. E. P., Hunter, W. G. and Hunter, J. S. (2005). Statistics for Experimenters: An Introduction to Design, Data Analysis, and Model Building, 2nd edition. New York: John Wiley and Sons. Jones, B. and Nachtsheim, C.J. 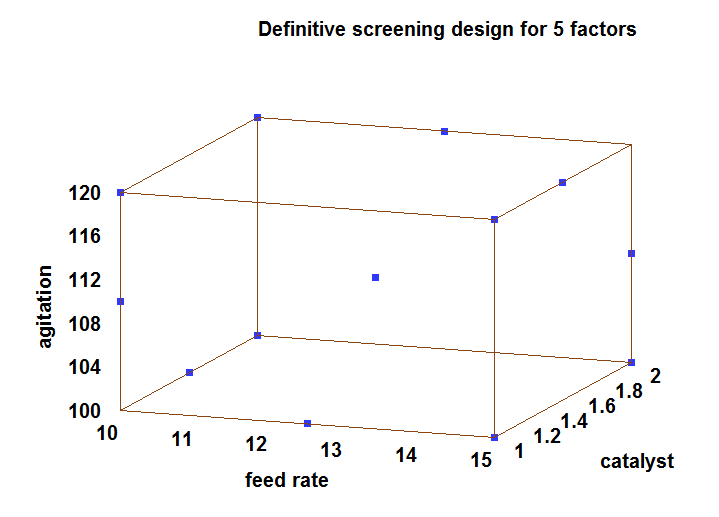 (2011) “A Class of Three-Level Designs for Definitive Screening in the Presence of Second-Order Effects”, Journal of Quality Technology 43(1), pp. 1-15. Jones, B. and Nachtsheim, C.J. (2013) “Definitive Screening Designs with Added Two-Level Categorical Factors”, Journal of Quality Technology 45(2), pp. 121-129. Jones, B. and Nachtsheim, C.J. 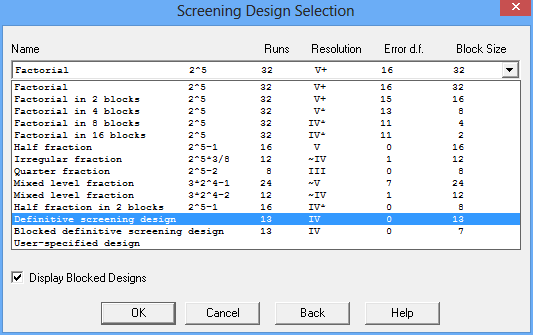 (2016) “Blocking Schemes for Definitive Screening Designs”, Technometrics 58(1), pp. 74-83. Xiao, L., Lin, D.K.J. 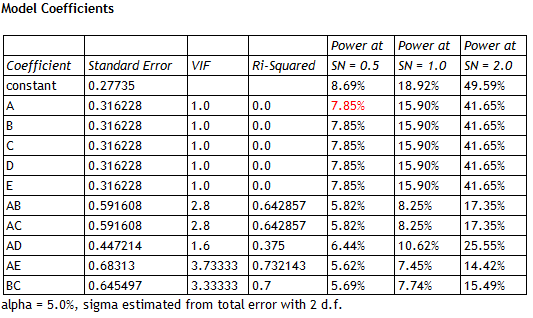 and Bai, F. (2012) “Constructing Definitive Screening Using Conference Matrices”, Journal of Quality Technology 44(1), pp. 1-7.